The start of the 2014 academic year for clinical medical students involves a host of talks about what they can expect. And therefore I thought I’d post my opening talk on Sep 8th which lasted 45 minutes and is available to download. tricky business trying to hit the right tone to interest students about EBM. 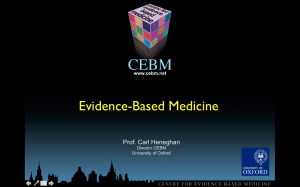 The messages include why we need EBM – the good and the bad. I’ve posted a blog on the golden hour as a great example of good evidence.